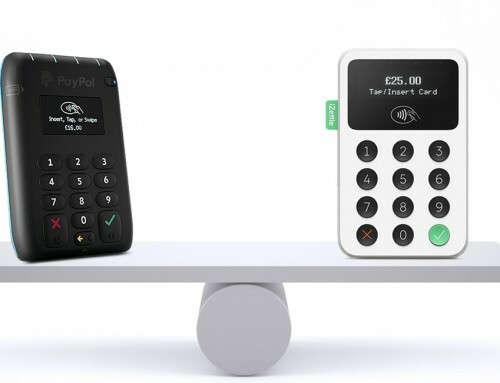 ⌂ > UK > Card Readers > Comparisons > Fee scales of iZettle and PayPal — how do they compare? So you’re ready to accept credit cards, but you don’t know which mobile point-of-sale solution to choose? It’s okay, it’s not just you – everyone has a difficult time choosing the right service. For most, it comes down to the price-versus-quality question. In this article, we are focusing on what you pay to use iZettle and PayPal Here in the UK. 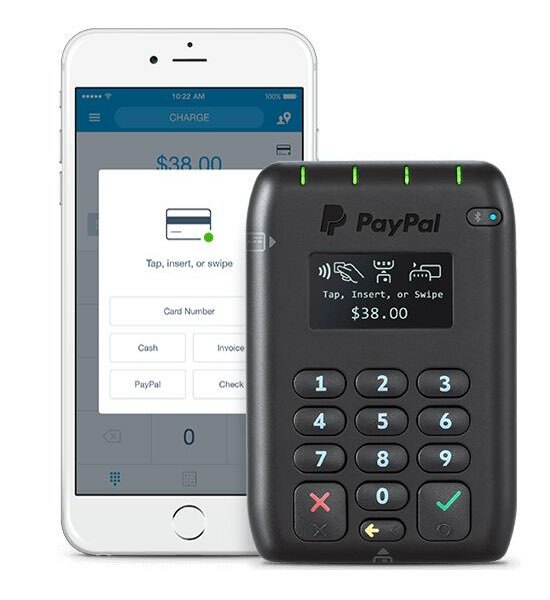 PayPal and iZettle offer similar solutions: a chip and PIN machine that promises to live up to the standards of every merchant. The basic idea is to capitalise on the iOS or Android technology by turning a smartphone or tablet into a card terminal when connected to a card reader. 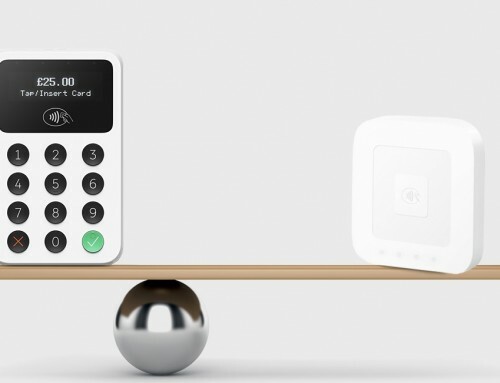 Both card readers offer certified security, great customer interface experience in the app, and useful sales reports and bookkeeping tools for merchants. 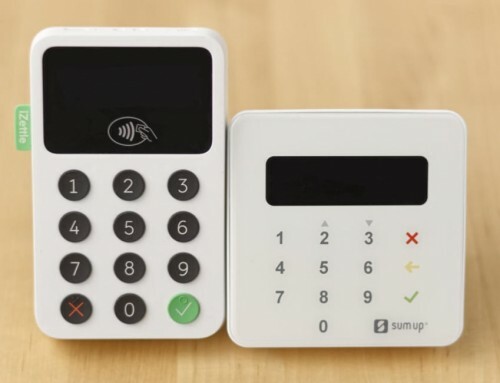 The pricing structures of the two solutions have a lot in common: the card reader comes at a one-off cost, there’s no contract or monthly fees, and merchants are only charged for the transactions they have. The PayPal Here card reader costs £45 + VAT. 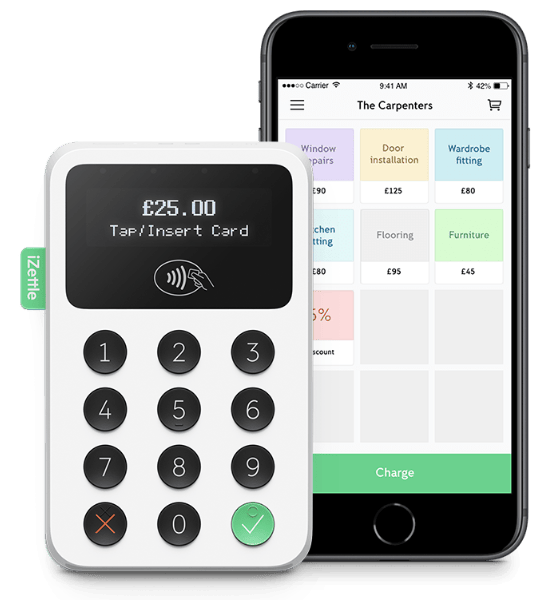 iZettle Reader 2 costs £59 + VAT (or £19 through our review). iZettle first introduced a dynamic pricing scale called “Smart Rate”, where the transaction fee gradually reduced as the sales volume increased. In 2017, however, iZettle changed this to a fixed percentage fee of 1.75%. Merchants making more than £10,000 a month through card payments can ask iZettle for a custom price plan with lower fees, but these are decided on a case-by-case basis. PayPal is built on a preset, stepwise pricing structure starting at 2.75%. The more you sell, the lower the transaction costs become. We should also mention that the PayPal fees referred to in this article apply to their “Blended” price plan only. PayPal has a more complicated plan called Interchange Plus with similar levels of pricing, but with variable fees set by Visa and Mastercard, making costs more unpredictable. In the Blended plan, PayPal has three pricing thresholds that merchants should consider when estimating monthly revenue: £1,500, £6,000 and £15,000. Businesses processing up to £1,500 card payments per month pay the default 2.75% transaction fee to PayPal. After that, it goes down to 1.75% per transaction. When you pass the £6,000/month threshold, you can pay 1.5% per transaction. When you pass the £15,000/month threshold, it is 1% per transaction. Per default, iZettle charges 1.75% regardless of monthly card volume, so it’s fair to say that for a volume less than £1,500, this is the more competitive option. If your business processes between £1,500.01 and £6,000, PayPal and iZettle have the same fee. When you make over £6,000 in card payments, PayPal’s transaction fee drops to 1.50%, beating iZettle. If you usually make over £10,000 a month, iZettle can go lower than 1.75%, but the percentage will be customised to your situation so we can only make assumptions about those fees. PayPal’s fee drops to 1% after passing the £15,000/month threshold. While iZettle’s pricing structure is easy to understand with its singular fixed percentage, PayPal’s graded structure could be beneficial once you’re above the £6,000 threshold. And we emphasise “could”, because PayPal’s small print mentions additional or higher charges for certain cards and card types, which apply to any sales volume. That is also why we cannot claim that PayPal costs completely the same as iZettle between £1,500.01-£6,000 where both providers have the same 1.75% transaction fee. We should also mention that the PayPal rates in the above table apply to Visa and Mastercard only. For payments with American Express, PayPal charges a standard 2.75% regardless of sales volume. Cards (including Amex) processed through manual entry and swipe are always charged at 3.4% + 20p by PayPal, and additional charges are applied to cards issued abroad. iZettle does not differentiate between cards. You’re charged the same for Amex as with Visa and all other card types, and iZettle even accepts UnionPay, Diners Club, Discover and JCB, which PayPal does not. 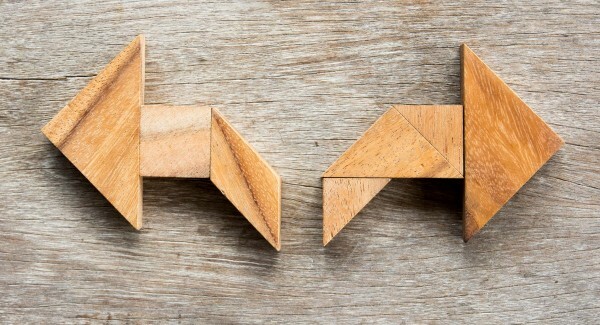 Let’s look at different sales milestones to see when you would benefit from each provider. If you’re making £1,400 in a month, you get the 1.75% transaction fee from iZettle, which means a total monthly cost of £24.50. Double your card takings to £2,800 per month, and you’re paying exactly £49. As for PayPal, the same £1,400 monthly volume gets you a 2.75% rate, making your monthly cost £38.50. Double that to £2,800 a month, and the cost could be £49 as with iZettle. But note: these example costs are if you’ve only processed Visa and Mastercard, and chip and PIN and contactless cards only. Any other card types will increase the cost. Processing between £6,000.01 and £10,000 a month is where the differences between providers get most interesting. Someone processing £6,500 a month will pay exactly £113.75 to iZettle, or £97.50 (1.5% plus possible added costs depending on the cards processed) to PayPal. If you make £7,500, you still pay iZettle 1.75%, which works out as £131.25. PayPal would charge you £112.50 for this amount, plus extra charges depending on the cards processed. *PayPal fees in table are for payments with Visa, Mastercard, Maestro, contactless and chip cards only. Higher fees apply to other cards. Above the £10,000 threshold, iZettle fees are up for discussion, so they could very well match PayPal’s 1.5% if you’re prepared to negotiate. If you increase your monthly sales to over £15,000, PayPal appears like the best choice with its 1% fee. But again, iZettle’s rates are customised beyond the £10,000 monthly volume, so their rates could match or be lower than PayPal’s. The tricky bit is deciding whether PayPal is actually cheaper than iZettle when PayPal’s blended fees are 1.5% or 1%. If you’re taking enough cards that are different than a UK-issued Visa or Mastercard through chip and PIN or contactless, the extra fees would diminish the marginal cost differences between the two providers, ultimately making PayPal pricier after all. As we have seen, the fee rates of PayPal Here and iZettle Reader are ultimately not that different. For merchants with a fairly predictable sales volume, one might come out better than the other. For monthly sales below £6,000, iZettle is the safest choice since their fee applies to all cards, while with PayPal, there is always a risk you’ll pay more for some cards. With PayPal, you also have to be on the standard 2.75% fee for at least the first month before you can qualify for the lower fees. One could possibly say that PayPal offers more potential savings, but with risk involved: you may get stuck just before reaching the next sales threshold, and as such, the fixed iZettle fee could be seen as a “safer” bet. With both services offering competitive transaction fees, the final decision likely depends on other factors. For example, if accepting American Express is important to you, go with iZettle for the consistently-lowest Amex fee. Furthermore, only iZettle offers UnionPay, JCB, Discover and Diners Club in addition to Visa and Mastercard. Another thing to consider is how and when you receive your money. PayPal first deposits payments to your PayPal account immediately after the card transaction, after which you need to withdraw it manually to your bank account. These bank account deposits are usually quick and can be done the same day. iZettle automatically deposits directly to your bank account within 1-2 business days of the card transaction. Lastly, merchants need to be aware of how the fee is processed. Unless you’ve negotiated lower fees with iZettle because you’re making more than £10,000 monthly, the 1.75% standard fee will be deducted from all transactions immediately, so all bank deposits are the full transaction amount minus the fee. In other words, you won’t get a bill at the end of each month, as fees have already been charged from each transaction. PayPal, on the other hand, is more complicated. Similar to iZettle, they charge their fee at each transaction so you receive the total amount minus the fee. But they will charge you the standard 2.75% until you have passed the £1,500 threshold for a month, and then the following month, you will be charged the fee applicable to the sales volume you had the month before. Every month thereby sets the benchmark rate charged at every transaction the following month. You will need to maintain a sales volume of over £1,500 per month to keep qualifying for PayPal’s blended fees. If the sales volume dips to lower than that, the standard rate applies again until the next time you’ve made over this amount in a month. Compare: PayPal vs iZettle – which has the best card reader service?